Indy IV updates and possible titles! 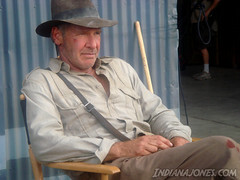 Fourth Installment of the Indiana Jones Adventures doesn’t hit theaters until May 22, 2008, but there’s still a lot of fun stuff to watch and see in the meantime, courtesy of our good friends over at IndianaJones.com. How amazing does Karen Allen look? 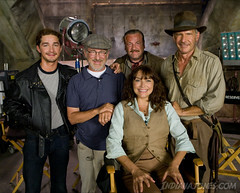 Also be sure to check out the videos, especially “Spielberg, Indy cast at Comic-Con” that was posted on July 27. It’s a lot of fun watching the gang together, and I still can’t stop smiling over the fact that Marion’s back. I’d like the third one if it was Fourth Corner of the World instead of Fourth Corner of the Earth, but otherwise the only one that sounds good to me is Indiana Jones and the City of Gods. They could call it Indiana Jones and the Chicken Salad Sandwich and I’d be there with nachos and a Coke, but it’s still fun to speculate. There’s also the possibility that these titles were registered as red herrings and that the final film will be called something else entirely. We’ll probably find out before May 22! New 3:10 to Yuma poster! Dinosaurs will shoot you in the face!